The race is on in many schools and districts to design brain-friendly, modern classrooms and buildings. As research suggests, learning space design impacts student growth, and the answer for some schools and districts is to buy new furniture. Though furniture can play a role in supporting positive changes through modern learning spaces, racing to buy furniture is also the fastest way to achieve a small impact on learning and perpetuate a fad-chasing culture. To avoid this, it is essential to ask a question central to high-impact learning spaces: What are your verbs? This can be a confusing question on the surface, but is key for all teachers and leaders working on space design changes. The verbs of a space, such as explore, discover, create or make, help to guide purpose for instructional practices in that space, technology tools used to support that space and design that allows the space to be supportive for students. Once teachers and schools establish the verbs of a space, decisions become design-focused. Without this focus, decisions surrounding learning spaces can take the form of decoration, convenience or replication of the purchases of other schools and districts. Knowing the central verbs of a learning space also opens up a new conversation about what mindsets are encouraged for students. Is the classroom a place where the pursuit of knowledge is central or a place where students create, make and design? Is it a space that leads to the knowledge needed to be successful in doing these verbs well? For some schools and districts, design conversations arise from a desire to increase joy and engagement, while others try to maximize the potential benefits of technology tools. Regardless of the reason, it is important for all of us to take steps toward more robust conversation. The verbs of a learning space can serve as an opener for conversation between students, educators and the community. It can also lead to practical changes and the use of all spaces in the building for learning. I examine these concepts in greater detail in my course, Designing Brain Friendly Learning Spaces. In this digital learning space, we focus on three verbs: discover, consider and tinker. We believe these verbs surround the content and learning, making it an accessible course for many educators. There are times when it seems like we are continuing to circle back to the same questions about learning and leading. This can be exhausting to feel as though we are all on a hamster wheel with no progress and no growth beyond the persistence of asking the same questions. Many of these questions have been asking and answered with the answers being complex and hard to implement, so instead we continue to ask the questions. I wonder where the new questions lie. I wonder if asking new questions will bring resolution to any of the old question. I wonder if there really are any new questions to ask. After twenty years of the question storm, I believe external disruption is near. Schooling is changing no matter how hard we hold onto tradition, and this is becoming clear as the tired questions of learning and leading are no longer being asked because they no longer matter. Are we really asking about professional development when every educator has access to all of the best practices and information that they need asynchronously? Are we asking about grading practices when the evidence is no longer being debated that so many grading practices negatively impact learning? Are we asking about purchasing textbooks when open education resources abound? Are we asking about how many desks that we need to order for next school year when we are sure that the furniture needs of classrooms are fundamentally different? Are we asking about internet access needs when we know that information access is the fifth utility? What if we chose to ask maybe not new questions, but different questions that showcased our understanding that the complex nature of learning and leading is growing? What if we considered some really hard things and then made some strategic changes in our efforts in learning and leading. Try a few of these questions on when you are looking to explore new territory, ideas, and paths for leading and learning. Is there structural racism in nature? How does the answer impact schools? Is civic engagement the equivalent of informed consent in democracy? Are we willing to handle the consequences that come from moving to greater equity? How can we change the IQ of our organization? Does growth always mean gentrification? Will anything work when there is a culture of exclusion? From the beginning, parents are telling stories. They are picking up books and reading them to their children. They are passing along oral history. They are telling amazing tales to help children fall asleep, but soon they are sharing these storytelling duties with the facilitators of learning in schools. Students are then surrounded by constant story. It shapes their understanding of the world, and it allows them to make sense of their complex world. Stories begin to shape what is seen as good and right and they illuminate the things that weigh us down. It is story that can bring us happiness in sad moments, and it is story that can bring perspective to confusing moments. Stories are the evidence that allow us to make judgments about what serves us well, and it is the stories about schools that allow communities to build a narrative about the effectiveness of education. Stories about schools paint a picture about what learning should look like, and stories about schools help us understand the learning experience of students. Stories connect past learning models to future possibilities in learning, and stories provide parents with the information they need to share to the greater community about how schools serve their students. Stories are a powerful elixir. Stories are a powerful weapon as well. If we share the stories that showcase the humanity of children in their worst moments, people begin to believe that these stories represent the totality of the culture of a school. If we share the stories of pain, tension, and stress that are a natural part of a learning organization, there are many that see this from a deficit mindset. Stories without context, stories without perspective, and stories embedded in the wrong emotions can fracture the potential for a powerful parent partnership. Stories are central to the work. Stories can cultivate success. Stories are what keep us from the shifts in mindset that we need. All are meant to live in community. Following hurricanes and floods, communities come together. After incidents like the Las Vegas tragedy, communities rally together. When two young girls lose their mother to cancer, the community circles around in support. We are all at our best when we are in community. Being alone and isolated for long periods of time doesn’t bring the happiness that communal life can bring. We are living in a time when the power of community can heal trauma, impact the effects of mental illness, strength our compassion for others, and rebuild crumbling social structures. Learning how to live in community begins at home and continues into our schools. Schools are laboratories for community building that are maximized when they occur in tandem with a variety of partners. 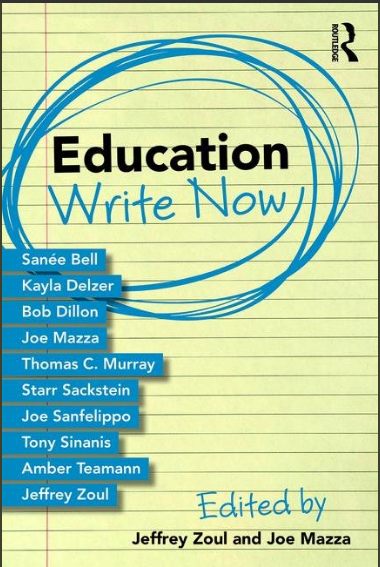 Recently, I had an amazing opportunity to learn, grow, and write in community with some incredible educators from around the country as a part of the #EDWriteNow project. The concepts of the project was to bring ten writers together in one location to write 5000 words each about how we should reconsider and change a variety of aspects of education. With the support of Routledge Publishing, we completed this amazing project in July that will support an organization that believes in this power of community, The Will to Live Foundation. The focus of my writing for this project revolved around the question of how we can change the way that we think about partnerships in schools. Below is an excerpt from my chapter. As we move from a time when it takes a village to support all children to a time where it takes a global village and deep partnerships to do the same work, it is essential that we begin to shift the understanding of what it means to partner with schools in a way that creates a genuine modern community around students and adult learners. Many schools are pursuing new and different community partnerships to support their modern learning environments. In some places, these are emerging out of strengths as resources in the community are entering the district to both supplement and supplant. They are also surrounding good and excellent programming to give students additional experiences and opportunities. In other locations, partnership development is coming from shrinking budgets and the need to supplement classroom teaching because of teacher shortages or lack of supplies. We are in a time when it takes a cohort of educators and partners to bring the rich learning experiences that kids need. It is essential that all classrooms, schools, and districts continue to look at community partnerships as a way to bring modern learning experiences to all kids. Seeking these partnerships is the right and moral thing to do for all of our students as the learning outcomes that we seek grow more and more complex. I’m excited to see how this book comes together, and I encourage you to read the blogs of the other contributors as we approach the publish date in December. Jeff Zoul addressed changing the way we think about change by looking at how and why we need to make changes with today’s changing times. Next, Tony Sinanis wrote about changing the way we see learning, a vital conversation. Third, Kayla Delzer, followed up with ideas about changing the way we think about relationships in school. In previewing the fourth chapter of our book, Starr Sackstein, dove into changing the way we think about assessment. Tom Murray touched on changing the way we think about technology in the classroom. The amazing Sanee Bell wrote on the importance of teacher engagement. The genius of Amber Teamann shines through as she wrote about the need to change the way we lead. It is amazing how community shapes our lives, fills our souls, and shines a bright light on the best that we can be as individuals and as a collective. The weight of these times and its tragedies are best healed together in spaces of comfort, compassion, and intentional contemplation. Let us grow our places of learning to realize all that is possible when we come together as one. Here are my remarks from the Transitions17 conference sponsored by the University of Melbourne. Thanks to everyone involved with #Transitions17. It is amazing to share the stage with so many incredible scholars and represent the students, staff, and community of the School District of University City. My name is Dr. Robert Dillon, and I serve as the Director of Innovation for University City Schools in Saint Louis Louis. In addition, I work with teachers, leaders, and districts around the country to build the capacity needed to have rich conversations about learning space design. Much of this journey is captured in a book that I coauthored with Rebecca Hare called The Space: A Guide for Educators. The book, much like this conference, is designed to share trapped wisdom, move the conversation forward, and get educators thinking like designers. Many incredible questions have emerged from the last few years of conversations with educators, but there is one question that won’t go away, and it is the basis for my recent research with our middle school in University City. The question is, “what if we already know all of the answers?” It is an odd question for a research gathering, but it is this question that shapes my work. Does nature know the answers surrounding how we should design spaces? Is nature, even in its most violent moments, speaking to us about how we should design spaces for learning? I do believe that every step we take in nature holds clues to the types of learning habitats that support the learning habits that we desire for students. Many artists have spent their career exploring these same questions. From Georgia O’Keefe’s communing in New Mexico with the essential aspects her surroundings to the amazing work of Andy Goldsworthy, who bring us sculptures that are baked in the wisdom of his surroundings. These artists coupled with my moments of noticing have led me to start the conversation with students and teachers at University City that before we talk optimal space design, we owe it to ourselves to explore the wisdom of biomimicry. Many have asked why we would do this and what are the true solutions that we are trying to pursue through our design work. The answer is complex, and it takes some background about University City, to see the challenges that we experience and why design and spaces are central to our solution making. 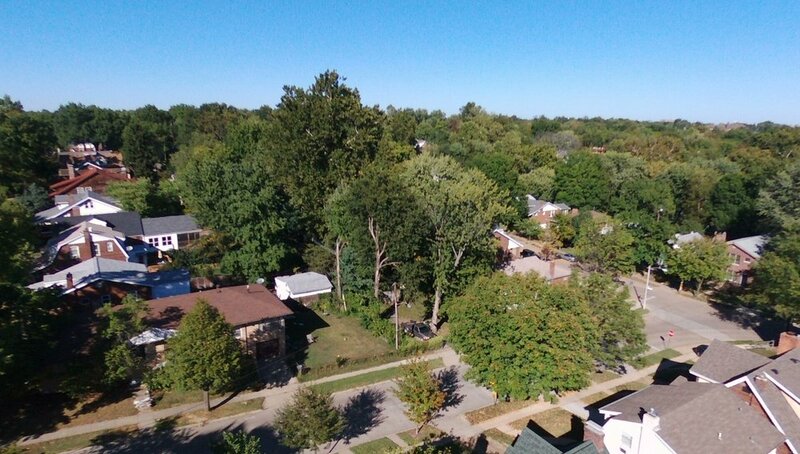 6.8 miles from University City is the city of Ferguson. Just over three years ago before the wounds of racism and slavery opened in places like Charlottesville, Minneapolis, and Baltimore, Ferguson was the epicenter of anger around systemic oppression. The murder of Michael Brown threw a blanket over our community as well, writing a single narrative about the inevitable outcome of our students and how they would travel on the school to prison pipeline. Our work to envelop our students with healing spaces mattered deeply. We were also looking for ways for our classrooms to be places that positively impacted the experience gap of students in this country. As students return to school, we knew that our students wouldn’t have the variety and quality of learning experiences outside of school, and this would figuratively coat them with teflon. This teflon suit would prevent learning from sticking to our students. To battle this, we realized that all of our learning space needed to turn teflon into velcro, so that learning would stick to our students and we could begin to close the experience gap that too many of our students experience. Finally, we are designing spaces, having conversations, thinking about biomimicry, and noticing nature because just over 70% of our students experience poverty in their lives. Though rich in spirit, many of our students need the benefits of excellent learning spaces to combat, trauma, fatigue, and negative energy that surrounds them. With all of this in tow, we started to design our first space with the hope that it would help to heal with nature’s solutions. The space was formerly a meeting room and computer lab that had aged and grow old, and it was an energy vampire of a space. To begin the transformation, we studied Dr. David Thornburg’s work around promoting communication and a sense of community in classrooms. The idea of a campfire being a gathering place, the water hole filling us with ideas and conversation. We also looked at the importance of the cave and quiet space and the idea that a space needs to feel alive and energizes by all that it is. We were also dedicated to giving the space time to breathe. We believed that the best space transformations can’t go from a full old space to a full new space. The space needs time for the mental models of its past to fade and the possibility of what could be surface. Our new space is emerging, notice that I say emerging, and not completed because I have a hard time believing that learning spaces are ever complete. We are dedicated to continuing our journey with biomimicry and learning about the solutions that nature may have already designed for us. We are looking to nature in a few areas already. Erosion is nature’s way of letting us know that gravity is strong. Where are the nature places where gravity impacts our rooms? Does this support learning or inhibit it? The flow of the river is powerful, and the ancient saying that you can’t step in the same river twice pushes us to believe that agility and flexibility are cornerstones of a great space. Sunset is my personal favorite moment of the day. I feel connected, reflective, and a part of something bigger. These are all traits that we want in our modern learners. The nest is a powerful metaphor in learning. How can we support and nurture while preparing our students to fly. We want our spaces to be a huge part of this process. We have considered the power of the waterfall, and how it is noisy with purpose. It is also a place where you can feel nature’s power, and we want our classrooms be places where you can feel that same power. Finally, we consider the fire. Beyond the campfire, the fire needs oxygen and fuel, both things that our classrooms need along with the spark of an amazing teacher. As we move forward, we are dedicated to a number of things. The first is that we continue to design with and not for students. Too much of formal education is done to kids, and space design doesn’t have to fall in this trap. We are dedicated to linking our growing learning model around project based learning to the wisdom of nature’s solutions and coupling it with a learning habitat that maximizes possibility. Our work is focused on a design process that asks all of us to adjust, study, and augment. All things that can help kids with or without a huge budget to redesign spaces. So what are our early results. We started school about five week ago in Saint Louis, and in that time we are seeing two clear positive results. Students are showing a deeper engagement in their work in this space, and the students have more joy in their learning. As a middle school principal, I knew that most of my job was to get as many kids loving learning when they left me as possible, and our early results are showing that we are doing this. What’s next? We want to scale our work. More spaces, more classrooms, more people as a part of the conversation. We want to share our work, which is part of the reason why I’m here, and we know that sharing our work will tighten our message, our purpose, and our ability to deliver the solutions that we think are possible with learning spaces. We return to the question of whether nature may already have all of the answers. I doubt that nature has all of the answers, but I believe together we has a group of scholars, teachers, leaders, and students that can build the solutions needed to help all students love learning, feel whole, and know that their ideas and voice matter.